Everywhere I look, I find inspiration all around me. The other day, while on my way to Chadstone to do a spot of shopping, I stopped at the traffic lights ( I know, boring, hey? ), but guess what I saw? 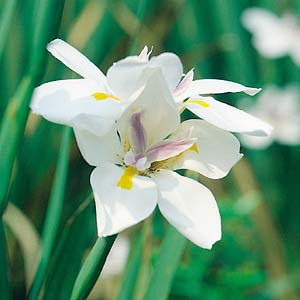 A beautiful white, lilac and yellow native flower. (I looked up the flower and it's actually known as the Diates Grandiflora.) That's when my inspiration began! I started picturing different style ensembles using this colour pallete and my first look was a white blouse tucked into a white skirt, a patent leather lilac skinny belt with lemon coloured heels ! Then I changed it around again to a different combo. The inspiration was whirling around inside of my head! I found some photographs of a variety of looks using this colour palette. What do you think? Amazing where you can find your style inspiration. Isn't it? Where do you find yours? I've stopped there plenty of times before, but this time I looked directly outside my window. The flowers there were so pretty, it prompted my thinking..I couldn't help but be inspired! Clara, I'm pleased you are enjoying my blog! Oh thanks Elpi. So sweet of you!